University of Minnesota researchers have broken new ground in the rapidly advancing field of 3-D printing: Creating stem cell-infused scaffolds that could be implanted in spinal cords to repair nerve damage. 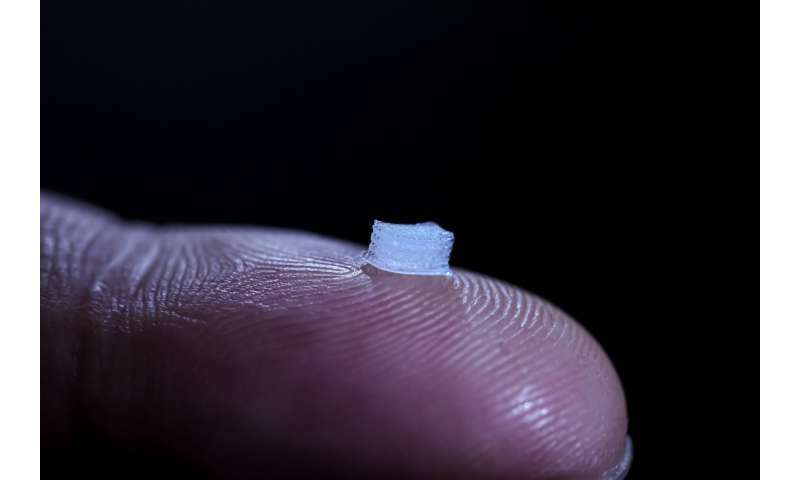 The technology has existed for years to print plastic implants containing live cells. But the challenge was to do so in a way that would allow sensitive "neuronal" stem cells to survive the printing process so they can repair nerve damage after transplant. "No one has been able to print those stem cells where they differentiate into active nerve cells using a 3-D printer," said Michael McAlpine, a U mechanical engineer who teamed up with Dr. Ann Parr, a neurosurgeon, to lead the research. "The cells have to survive the printing process." The team recently reported a printing approach that allowed for 75 percent survival of neural progenitor cells, which are limited stem cells capable of producing brain cells. Results were published in Advanced Functional Materials, a prestigious technical journal. A university video demonstrates how the soft rubbery scaffold could be printed in layers along with hydrogel, a special ink that coats and preserves the stem cells. "You need to have something around the cells so that when they are printed they are happy—basically, they stay alive," McAlpine said. Use of the technology in regenerative medicine for human patients remains some years away: The printed scaffolds have to be tested in animals to see if they repair spinal cord damage, and then human tests would follow. The discovery is one in a series involving 3-D printing, which was initially used in health care to create models for surgery practice, but now is being studied for the creation of everything from skin grafts to solid organs for transplant. U engineers also were among the first, three years ago, to report success in printing scaffolds that could be implanted in peripheral nerves to guide their repair and regrowth. Peripheral nerves "grow like weeds" and only need that structural guidance, McAlpine said. But nerves in the spinal cord don't appear to regenerate as aggressively unless the scaffold gives them direction and the stem cells help them fuse together, he said. Roughly 17,000 spinal cord injuries are reported in the U.S. each year. Even if this 3-D printing approach could restore only limited function, it would be a significant advance, Parr said. "There's a perception that people with spinal cord injuries will only be happy if they can walk again," she said. "In reality, most want simple things like bladder control or to be able to stop uncontrollable movements of their legs. These simple improvements in function could greatly improve their lives." Could nose cells treat spinal cord injuries?